TWPT: I know this is not book related but I have to ask, how have you and your family been handling the heat wave that has gripped the northeast for the last week or so? I think it has broken for now but we are only in July at this point. TWPT: I think the last time we spoke was back in 2008 when we were talking about your latest release Circle, Coven & Grove and your upcoming book at the time which was Everyday Witch A to Z which was in the same vein as the book we are talking about today. Other than writing what have you been up to over the last couple of years? Did you make it out to INATS West (International New Age Trade Show) this year? I’ve never made it to INATS, although pal and fellow Llewellyn author Raven Digitalis says it's a blast. There is something other than writing? Really? Why didn’t I get the memo? Seriously though, my life is much the same outside of the writing world. I still manage an artists’ co-op shop, make and sell my jewelry, hang with my coven, Blue Moon Circle, occasionally officiate at a handfasting, do my healing work and tarot readings, and tend to my house and garden. Still no guy, alas. Most of the big changes have been on the writing side. As much as I love the nonfiction, I have shifted my focus to writing fiction instead. (Don’t worry, I still do lots of articles for the Llewellyn Annuals, and have a new ongoing column in the WITCHES & PAGANS MAGAZINE.) After two years and three novels, I finally got an agent this March, and we are shopping an Urban Fantasy series with—naturally—a Witch as a protagonist. TWPT: Exactly what is it that authors such as yourself do when they go to the INATS show either east or west? How helpful are the contacts that you make there? DB: I've never been to INATS. But I’ve gone to Pantheacon out in San Jose twice, once this last February. P-con is a huge Pagan convention and I absolutely love it. If it weren’t all the way across the country from where I live in Upstate NY, I’d go every year. And I do hope to go next February, since I’ll have two new books out. I’ve found Pantheacon to be amazing in terms of networking. I always give a workshop or two while I’m there, and they have been really well attended (and I’ve signed and sold a lot of books afterwards, which is always fun). 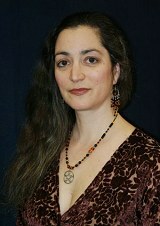 And I get to hang with other Pagan authors, meet up with my wonderful editor, Elysia, and generally have a great time. I highly recommend it. 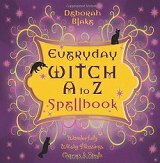 TWPT: Your latest book which just came out this month (July 2010) is called Everyday Witch A to Z Spellbook. With the name being very similar to your other book I’m going to guess that this is related in some way. Tell me about how your new book relates to your other book with the similar name? DB: They are companion books, in that they both have the same general fun style and approach, and are both co-written by my black cat, Magic. But you don’t have to have read the first one to use the second. The original A to Z is sort of like a general guide, whereas the Spellbook is, well, a spellbook. TWPT: I noticed in the promotional literature that I received the words “thoroughly modern Witch” appears. Could you tell me what the term “modern” means in this context and what it is that makes a Witch “modern” these days? DB: That’s a phrase that Llewellyn came up with, I think. After all, any Witches living today kind of have to be considered “modern,” eh? But what they’re talking about is the modern practice of Witchcraft, as opposed to practices that might be more oriented around older rituals and approaches. [Obviously, both approaches are perfectly legitimate—it is just a matter of which one works best for you.] I consider myself to be a modern eclectic Witch, in that I take a little bit of everything that works and resonates with me, and I integrate it into my own personal practice. TWPT: Ok, why another spellbook? There are a lot of spellbooks out there so what is it that makes Everyday Witch A to Z Spellbook special and unique among the other titles that already grace the bookshelves? So there are spells for everything from dealing with addiction, healthy weight loss, potty training, getting ahead at work, and my personal favorite, the “Jerk Avoidance Spell.” Who doesn’t need one of those from time to time? There are spells for all kinds of relationship issues, health problems, and yes, even a love spell or two. (Although I always advise extreme caution with those.) Hopefully there is a spell to deal with almost any issue a person might have. If not, folks can tell me what they wish I’d put in there—I’m going to be doing a bunch of spells for an upcoming Llewellyn Spell-A-Day Almanac, and I could put them in there! TWPT: For those who might be approaching this topic for the first time what is a spell and why as you said in this book “is a spell a very powerful tool indeed and should be approached with care, knowledge and respect”? DB: It is hard to give a good short answer to this question, and I do discuss it in more depth in the book. But generally, a spell is a way of sending your energy and intent out into the universe, usually in order to create positive change. (I don’t mess with the negative stuff, but obviously some people do.) Spells are powerful tools because they DO WORK. Not always, of course, and sometimes not in the way you thought they would, but they do work. So you have to be careful how you use them. TWPT: When you started to write this book what was your main premise in terms of the type of spells you wanted to include and how did you go about working your way through all the various types of spells systematically? DB: I sat down and wrote down all the topics I could think of for spells I might find useful. Then I asked all my coven-sisters to add to that list. And then my editor gave me some more suggestions. In the end, we came up with a pretty extensive list! Then I sat down and wrote them. And then my production editor read the book and said, “Hey, you left out-----“ and back I went! TWPT: How are the spells organized in this book? DB: As the “A to Z” name suggests, they are in alphabetical order. That makes the book really easy to use. There is also a list of all the spells at the front of the book, and at the back of the book the spells are grouped together under general topics, to make it easier for people to find whatever they’re looking for. For instance, there is “health,” “relationship,” “lifestyle,” etc. TWPT: Does the book include anything other than just the spells or do you presume that most everyone who picks up the book will be familiar enough with spells and spell work not to need any other guidance? DB: I never assume. You know what happens when you do that. (Laughs.) There is an initial intro chapter explaining the book, a chapter on casting and crafting spells, and a chapter that Magic the Cat insisted on putting in about working with familiars. Absolute beginners should have everything they need here to get started. And more advanced practitioners can just pick up the book and start casting spells. TWPT: What kind of blessings, charms and spells does this book contain and what was it that guided you in what you wanted to include and what you were not going to put in the book? DB: Although there are specific blessings for dawn and dusk, children, pets and cars, (among other things) and a protective “Mercury in Retrograde” spell! TWPT: Although it isn’t out yet you have a 2nd new book coming out in September of this year. I believe the book is titled Witchcraft on a Shoestring: Practicing the Craft Without Breaking Your Budget. Sounds rather intriguing especially in uncertain economic times. What can you tell me about this new book and who will derive the most benefit from reading it? DB: The title sums it up pretty well, I think. This book is a small handy guide filled with suggestions for how to practice Witchcraft cheaply. There are recipes for feast food, crafts, lists of inexpensive substitutions for more expensive supplies, and a list of 50 easy things to do for nothing or next to nothing. It’s practical, but also a lot of fun. And I’m hoping it will benefit everyone, since it covers a lot of territory. TWPT: Now I’m assuming that since you wrote a book about practicing Witchcraft on a shoestring that the general perception of getting started on this path or staying on this path is that it costs money for tools, supplies etc. Would that be a fair assumption? And if so why is it that everyone believes that their spiritual practice will be enhanced by investing more money rather than simply investing more personal energy and more time into the effort? DB: Oy. That’s a complicated question. Yes, I think many people believe you need a lot of tools and supplies to practice Witchcraft. There’s an entire chapter in Witchcraft on a Shoestring that explains why that isn’t true. Admittedly, it can be fun to get all the tools and supplies, and some of them do make parts of a Pagan practice easier—no question about it. My house is filled with Witchy stuff. But is any of it necessary? Not really. As for the second part of this question…you do know we live in America, right? (Snort.) But seriously, I wouldn’t say that everyone thinks this is true. I know plenty of Witches who don’t use much in the way of tools or supplies for their practice. In fact, I’d say that’s true for most of the women in Blue Moon Circle. When the idea for this book was first suggested to me (by two completely different people), my initial response was, “I’m the wrong person to write a book about practicing Witchcraft on a shoestring, since I don’t think it has to take a lot of money.” Eventually, I realized that actually made me the RIGHT person to write it! TWPT: Of course if you have the money to invest in all the paraphernalia that is fine. In your own practice how do you incorporate the concepts of practicing on a shoestring? DB: Lots of ways. For one thing, I don’t buy everything new. I own a lot of books on Witchcraft and all sorts of associated topics, but some of them I got used, some I swapped for, some I got on sale… I make some of my own tools and supplies, and sometimes I buy things in bulk (like white sage, which I use a lot of, and which doesn’t grow where I live). I grow most of my own herbs, and those I don’t, I often get from the bulk bins at the local health food stores. Much of my garb I either made myself (like my cloak, which is simple to sew—my sewing skills are minimal) or are re-purposed (like a funky skirt I found at the consignment store). I try to save my bigger expenditures for things I can’t get cheaply or make myself: some books, larger crystals, etc. It’s all about prioritizing. TWPT: Well with 2 books out in the same year, (you have to tell me how that came about as well), are you taking a break for the rest of 2010 or do you just continue to write regardless of when your last published work came out? DB: My goal had been to write 5 books in 5 years. But I finished the last book way ahead of my deadline, and because it is so timely (and they thought people needed it Right Now), Llewellyn decided to release it much earlier than we’d originally planned. Which makes the publicizing part a bit hectic, as you can imagine! I don’t have another Pagan book in the works right now, but I am writing five or more articles for upcoming Annuals, and working non-stop on the next novel or three. There is rarely a time that I go more than a couple of days without writing SOMETHING. TWPT: I also hear that you are doing an online writing class as well. What’s that all about and what made you decide that was something you wanted to pursue? I took a few online writing classes and they were really helpful. Many times they are given by experienced (published and successful) authors, in part as a way to get their names out there, and in part as a way to give back to the writing community and help up-and-coming authors. Those are all my goals as well. Besides, it is fun—although an insane amount of work! But as an unexpected bonus, it has led to me running an ongoing paranormal writer’s loop called The Creativity Cauldron, on the request of the folks who took my workshops—there are a bunch of great people there, all of whom work at supporting each other in their writing careers. Lovely. TWPT: Are you making any personal appearances at any festival or gathering this year? When you do get out is that something you enjoy doing? DB: I am doing a podcast later this month on The Parafactor online, but other than that, the only appearance I have scheduled right now is a multi-author booksigning event at the Saratoga, NY Barnes & Noble on September 11th. I’m really looking forward to that one, since I will be able to hang out with a bunch of other cool authors and also meet up with some of my fans. I will probably do something at the local Independent book store in Oneonta, The Green Toad, and our little Borders, maybe when the second book comes out, or closer to Halloween. And as I said, I hope to go to Pantheacon next February, but I’m not sure at this point. I love meeting my fans and talking about the books. I am not a particularly social person, but being out and about with bunches of Pagans is always a treat. TWPT: Any final comments that you’d like to add to this chat about something that is near and dear to your heart that I didn’t ask about? DB: Well, since you mentioned the heat wave, let’s remind people NEVER to leave their pets (or small children, for that matter) in their cars when it is hot out. They can die from the heat—sometimes in a matter of moments. And as a personal note, I hope that people will come find me on Twitter or Facebook, or at my blog http://deborahblake.blogspot.com and let me know what they thought of the books. I am always open to constructive criticism (that is to say, “I wish you had done---“ not “dang, this book sucked”) or requests for topics people would like me to write about. I’d love for people to check out my new “Magick on a Shoestring” column in the Witches & Pagans Mag (I am SO excited about having my own column, and I love the mag!). And if you like the books, please take a couple of minutes to leave a review on Amazon…you’d be surprised by how many people decide which books to read based on what other people have to say about them. Thanks so very much for choosing to spend a little of your time with me. I appreciate each and every one of you. My fans ROCK. TWPT: Thanks for taking the time out to talk to us about your latest projects and what is happening in your life beyond your writing. It is always nice to touch base again with those authors that we have talked to before here in the Author's Corner. I'm sure we will talk again soon.